PEEK biomaterials are currently used in hundreds of thousands of spinal fusion patients around the world every year. Durability, biocompatibility, and excellent resistance to aggressive sterilization procedures make PEEK a polymer of choice, replacing metal in orthopedic implants, from spinal implants and knee replacements to finger joints and dental implants. The new edition of this authoritative work sees the book expand from 17 chapters to 26 chapters to match the expansion in applications in PEEK—from spinal cages to spinal rods and disc replacements; hip and knee joint replacement; dental; trauma; and sports medicine. New PEEK formulations have been developed incorporating hydroxyapatite, additives to combat infection, and surface grafted polymers to improve lubrication. The book also covers additive manufacturing, which has made significant inroads with PEEK in the past 5 years as well by introducing the prospect of patient-specific implants. 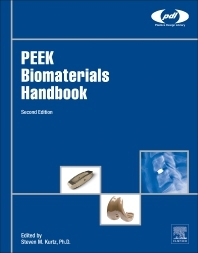 Like the 1st edition, the updated Handbook brings together experts in many different facets related to PEEK clinical performance as well as in the areas of materials science, tribology, and biology to provide a complete reference for specialists in the field of plastics, biomaterials, medical device design, and surgical applications. Useful for materials scientists and biomedical engineers, both in industry and academia, the book is a one-stop shop for information on PEEK as a biomaterial—including in-depth coverage of materials properties—while also providing cutting-edge information on applications and combinations of the material.